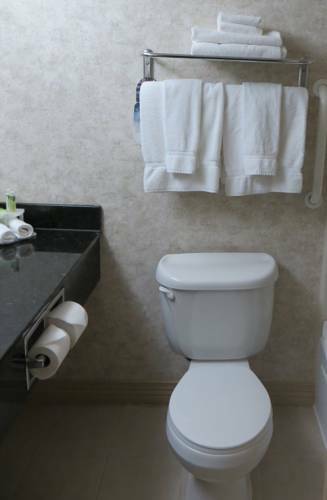 Enjoy Your Stay at One of The Best Van Wert HotelsLocated halfway between Lima, OH and Fort Wayne, IN, Van Wert is a quaint city that was once known as the "peony capital of the world". The peony farms are long gone, but the area is still home to many different farms, businesses and friendly locals.The Holiday Inn Express Hotel & Suites Van Wert is well-suited to business travelers. Situated near Highway 30, it's a convenient place to rest on your way to meetings in bigger cities. Local companies include Eaton Industries, Cooper Foods, Central Insurance and Braun Industries, and our Van Wert hotel's 24-hour Business Center allows you to print, fax or copy at the last minute.When you stay at our hotel, Van Wert, Ohio is at your fingertips. The historic city boasts many beautiful sites, including the County Courthouse and the Brumback Library, and interesting museums like the Central Insurance Fire Equipment Museum. Our Van Wert hotel is also near the Delphos Canal and Postal museums, as well as the Convoy Living History Museum. Families can enjoy the many festivals and events happening throughout the year, including the Peony Festival, the County Fair and rodeos.Our Van Wert hotel's spectacular amenities include an indoor swimming pool, Fitness Center, on-site guest self-laundry facilities and a complimentary, hot breakfast bar. Make your reservations today to take advantage of everything our hotel in Van Wert, Ohio has to offer!